CCTV Cameras that Look Like Smoke Detectors are They Allowed? Are CCTV Cameras inside of Smoke Detectors Allowed by Code? There are a lot of people that asking me if it is permitted to install look-a-like devices along with an approved fire alarm system. This is mainly the case with CCTV cameras designed to look like fire alarm system smoke detectors of smoke alarms. Now to the trained eye of a seasoned technician, it is always easy to spot these devices as they do not look like any of the system smoke detector or smoke alarm brands we have grown accustom to. Customers like these CCTV Smoke Detector devices because it gives them the sense of security without having to display an obvious CCTV camera. Most of the time, I feel that these are used in the situation where an owner wants to keep an eye on his or her employees. 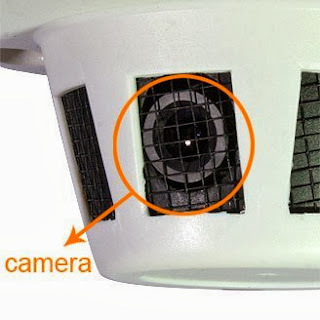 If the CCTV camera is hidden inside of a smoke detector, then the employees would be unaware they are being filmed and may be caught performing unlawful acts and then fired. In the case of preventing robbery I believe you should have an obvious CCTV camera in plain sight. This will act as a deterrent and possibly prevent any acts of theft in the first place. Now on to the question at hand. Are these Smoke Detector Cameras permitted to be installed along side an approved fire alarm system? Some people say no as they provide a false sense of security in the event of a fire emergency while others say it is just fine as it is not tied to or part of the system. The International Fire Code 2015 (IFC) section 901.4.5 - Appearance of Equipment. "Any device that has the physical appearance of a life safety or fire protection equipment that does not perform that life safety or fire protection function, shall be prohibited." Now this is like anything else. Always check with your local AHJ. Typically these discrete Smoke Detector CCTV cameras will be installed after the initial fire alarm inspection and won't be seen by the AHJ. If you notice one of these discrete smoke detector camera during a semi or annual fire alarm device test, note it down and discuss with the local AHJ. I believe that if everyone is on the same page and you have it well documented in your Fire Alarm Inspection and Testing paperwork, then you are covered. It is actually pretty deceiving. It gives you a false sense of security and it's not a good feeling. I hope they don't really use these kinds of CCTV on some of the stores here in our neighborhood.